I started following Scotland in the 1980s when I was a student in Edinburgh, but the Student Grant (this may well date me …no student loans in the good old days!) did not stretch to anything beyond the home games. My first experience of travelling was to Italia 90 and although I would definitely not recommend going from Glasgow to Italy by bus, the experience was fantastic and opened my eyes to the camaraderie, laughter, friendships, highs and lows that go along with following our team. So when I shacked up with John in 1991 and found that he shared the same passion, it seemed natural for us to go to the games, although at that time the constraints of work, holidays and finances, meant away trips were not as regular as now. In 1996 we started planning the trip to France 98, in the sure and certain knowledge that we would qualify – (can we get back to that please!!) and what a trip that turned out to be with c20 family and friends based south of Bordeaux and some of us travelling to the matches with tickets having been secured for 2 of the games via all sorts of swaps and deals (the fact that we could not get tickets for the Brazil game was what led us to join the SSC after the tournament). 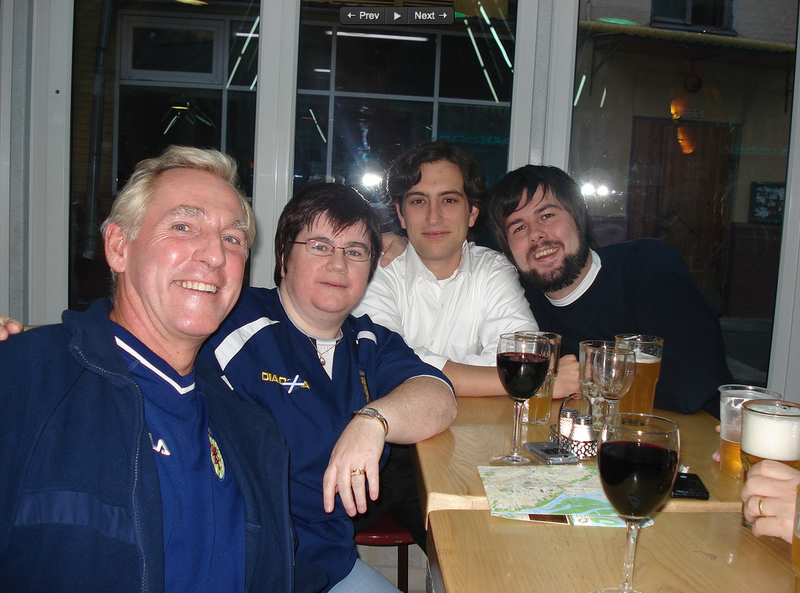 Other than having made donations at various events my first real awareness of the work of the Tartan Army Sunshine Appeal came in 2007 when we were back in Paris where, as it happened, I was working at the time, and whilst I was at work on the day before the game John headed off to join the donation to “Main Dans La Main” (Hand in Hand) at a Paris children’s hospital having been invited along by some of the original steering group. He came back to the hotel raving about the good work that was being done and the experience of seeing first hand the children being helped in really practical ways. Some of you might remember that trip when a wee march to the stadium from the Eiffel Tower and a shot from James McFadden who “just thought why not..” made for a great night all round. 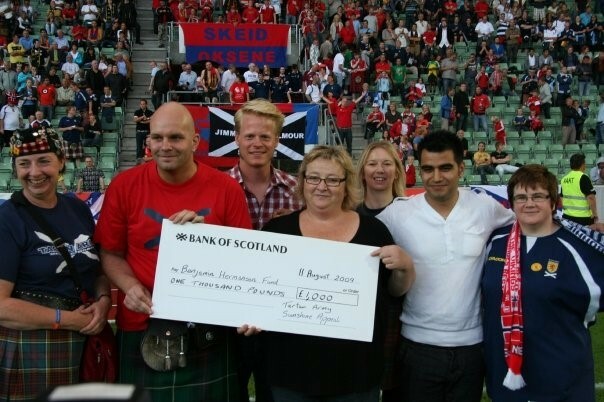 Since then I have been to many donations and fundraising events and each time just serves to cement my view of what a great cause this is and how much it fits with the very nature of the Tartan Army that I had first discovered back in 1990 – good people doing what they can and trying to bring smiles and laughter on their travels. 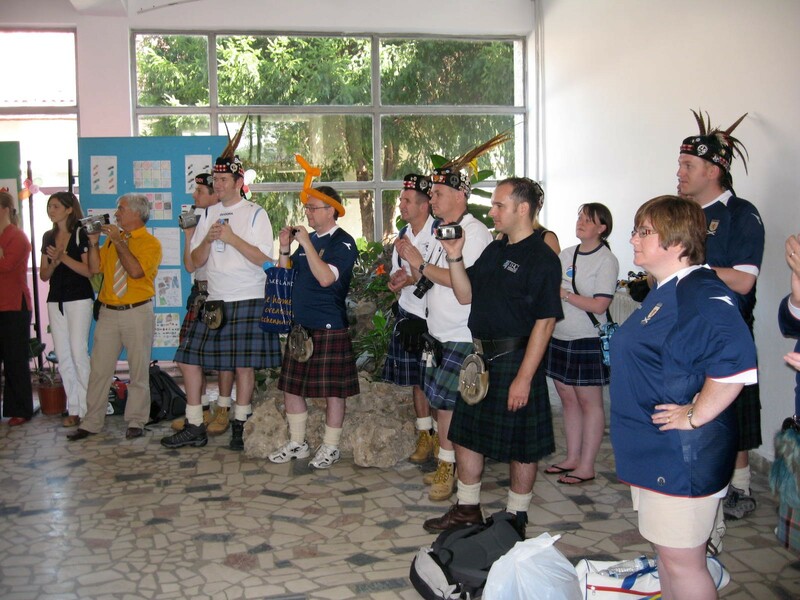 One donation that really stands out for me in typifying what TASA is all about was in 2008 in Macedonia where they were involved in a joint effort with Tartan Skopje. The organisation was called Topansko Pole which is an organisation working with children with mental disability using education and vocational training, as well as entertainment, sports and other activities to help their development. Some of the children lived in the facility we visited and some were there on a normal school day basis. There had been money donated to refurbish dormitories and toilet facilities and we saw the newly refurbished areas along with pictures of what had been there before – to say it was a night and day comparison is an understatement. That sticks in my mind as a really practical thing that made the life of these kids better but my memory of that day is much more vivid in respect of the emotion of the day. We went along with sweets, toys and badges to dish out, a couple of pipers to entertain and Eric the Cheeseman who had learned a Macedonia song, his rendition of which the children loved. In return the children had arranged entertainment for us in the form of a dance performance and a party with all the trimmings. I remember one young lady of about 9 or 10 years of age who was fascinated by the selection of plastic wristbands I had on – you know the ones with Scotland, Alba gu Brath, Cloverleaf Tartan army etc. – suffice to say that they were hers by the end of the party and you would think I had given her a million pounds. It was a joyful day and I felt privileged to have been invited along. The feeling of privilege at being invited along whenever I have been at donations since has never gone, although I admit I sometimes have to hide behind the sunspecs as it can be emotional …I am ok with that though, as I have seen many others feeling the same way. To those involved in the work of organising and fundraising I would just say keep it up, it is all worth it! If the idea is to “bring a little sunshine into the lives of children where Scotland play” it works!